Last week, in my 200th blog in this series (200 = 2 × 10 × 10), I discussed the word “digit”, which means both a number and a finger or toe, how the two meanings merge when we use one of our two lots of ten digits in finger counting, and how the Venerable Bede did it. The word “finger” derives from an IndoEuropean root meaning five, PENKWE, from which words meaning five in different languages (e.g. πέντε in Greek and quinque in Latin) have arisen in different ways, as I have previously discussed in detail. Fingerprints are distinct patterns of ridges in the tips of human fingers, a feature shared only by some other primates and, unusually, koalas. They are partly affected by the pressures that the fetus experiences in the uterus, to the extent that even identical twins do not have identical fingerprints, although the similarities are greater than in non-identical twins. The fingerprints of koalas more closely resemble those of humans than chimpanzees’ fingerprints do (Figure 1), supporting the hypothesis that fingerprints evolved to enhance grip while climbing. Fingermarks, whose history has been described by Colin Beavan in Fingerprints (2002), have been used for centuries for identification. Greek vases, for instance, bear examples as signatures. In India ceremonial fingermarking by an illiterate person was known as tipsahi. 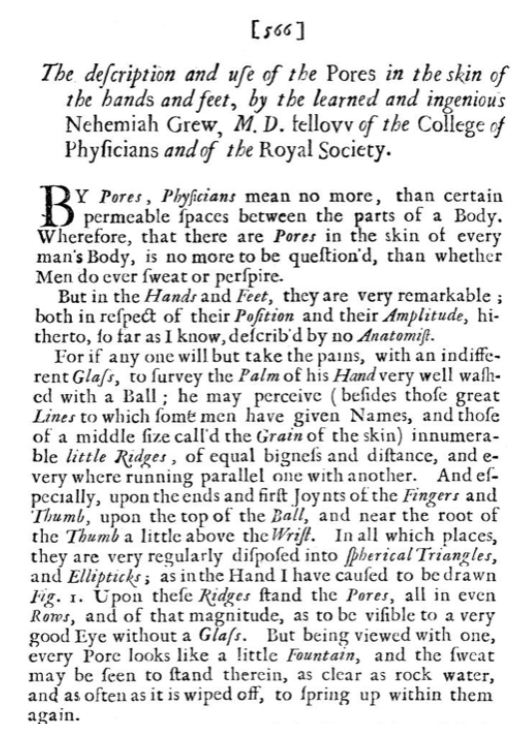 An English physician, Nehemiah Grew (1641–1712), used his microscope to observe his own fingertip ridges and published the details in 1684 (Figure 2). In 1788 Johann Christophe Andreas Mayer, a German anatomist, published evidence, in volume 4 of Anatomische Kupfertafeln nebst dazu gehörigen Erklärungen, that no two fingerprints are alike (“Obwohl niemals bey zween Menschen die Lagen der Hautwärzgen übereinkommen”). Fingerprints were first systematically categorized by Jan Evangelista Purkyně, a Czech anatomist and physiologist, after whom Purkinje fibres are named, in his thesis, Commentatis de examine physiologico organi visus et systematis cutanei, published in Breslau in 1823. The astronomer William Herschel (the Younger) devised a method for printing them in 1858, and used them for identifying signatories to contracts and the like. 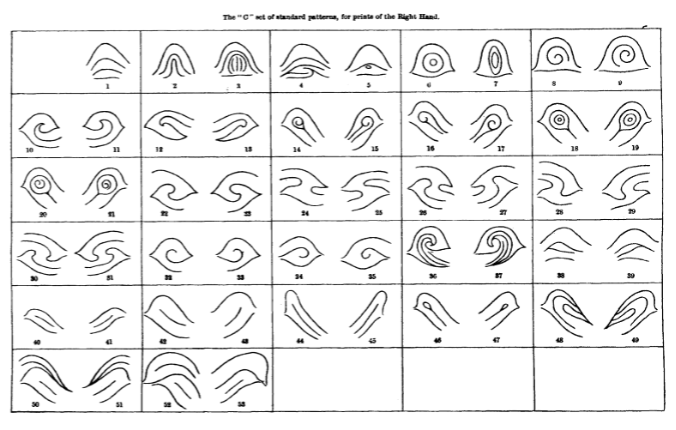 And Francis Galton wrote about the differences in skin creases in different individuals in his book Finger Prints (1892) (Figure 3). In a letter to Nature in 1889, a Scottish medical missionary working in Japan, Henry Faulds, described his studies on what he called the “skin-furrows” in human and simian fingers. [The term “skin-furrows” is not included in the Oxford English Dictionary, and Faulds’s use of it is the earliest instance that I have found.] Faulds suggested that fingerprints could be variously useful in studying other animals, in ethnological classification, in studying ancient pottery and mummies, and in the identification of criminals from bloody finger-marks. However, who was actually responsible for introducing this last use of fingerprinting was disputed. Faulds’s suggestion was ignored by Scotland Yard, and Herschel later claimed the credit. 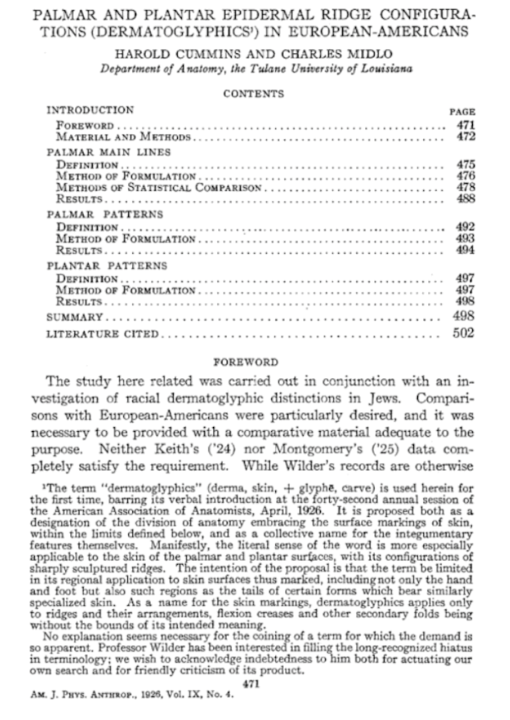 Whatever the truth of the matter, the technical term for fingerprints, “dermatoglyphics”, was invented in 1926 by Harold Cummins and Charles Midlo and was used for the first time in a paper on what they called “epidermal ridge configurations”, where they restricted its use to ridges and their arrangements, excluding flexion creases and other secondary folds (Figure 4). The word derives from Greek: δέρμα the skin and γλύϕειν to sculpt. “Dermatoglyphics” also leaves a distinctive fingerprint in the dictionary: none of its 15 letters is repeated, a feature it shares with “uncopyrightable”, first recorded in 1886. However, there is a 17-letter concoction “subdermatoglyphic”, which appeared in a 1990 paper titled “Chaos: to see a world in a grain of sand and heaven in a wild flower” by Lowell A Goldsmith: “The set of patterns that are the fine whorls, arches, and other finger-ridges probably have an underlying dermal subdermatoglyphic matrix determining their distribution.” However, in “Subdermatoglyphic: a new isogram” (Word Ways, 1991), Edward R Wolpow revealed the provenance of this word, which he had discussed with Dr Goldsmith. 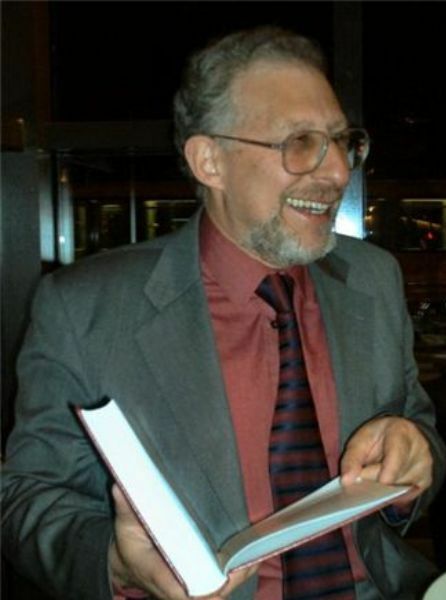 “The word SUBDERMATOGLYPHIC,” he wrote, “does stand a chance to blossom beyond this single citation if Dr. Goldsmith and his colleagues pursue their thoughts and investigations. In fact, eventual dictionary entry is not an unreasonable expectation.” It appears that Wolpow put Goldsmith up to it. His lexicographic expectation does not seem to have been fulfilled.